4.8.2.10 This schedule applies to all cash basis counties and cash basis cities. It does not apply to special purpose districts. Cities and counties may choose to prepare the Schedule 06 in lieu of Schedules 07 and 11. This is an option for the reporting year 2017 and 2018. 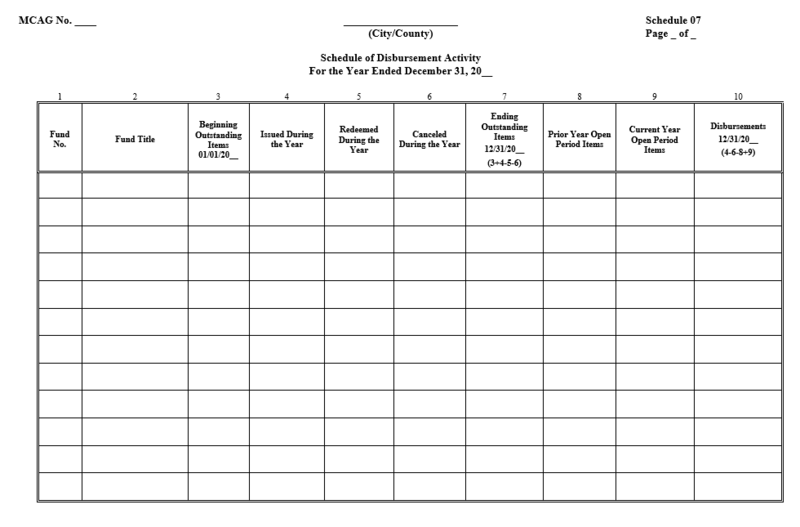 The Schedule 06 will be required for the subsequent reporting periods. 4.8.2.20 The purpose of this schedule is to facilitate reconciliation between cash disbursements and expenditures. The schedule is also used to demonstrate controls over outstanding warrants. 4.8.2.30 The schedule should include all disbursements regardless their method, i.e., checks, warrants, ACH, etc. 4.8.2.40 Total disbursement activity should be presented by fund. Cities and counties that use claims and/or payroll clearing funds may show activity in the clearing fund rather than in the originating funds, as demonstrated in the following example. 4.8.2.50 This schedule must be prepared for all funds, including special purpose district custodial funds that would not be presented on the financial statements. Counties may combine on one line all warrant activity for those school districts that issue their own warrants, but warrant activity should be reported separately by fund for any districts for which the county issues the warrants. Other than these exceptions, the schedule should be prepared on the same basis of accounting, for the same period and reporting entity, and using the same underlying accounting records as the Schedule 01 and financial statements. Fund number for each fund with disbursement activities. Beginning outstanding items on January 1 of the reported year. Outstanding items are the total warrants, checks and other disbursements that have been issued but not yet redeemed (that is, deducted from the bank account). All warrants, checks and other disbursements issued from January 1 through December 31 of the reported year. 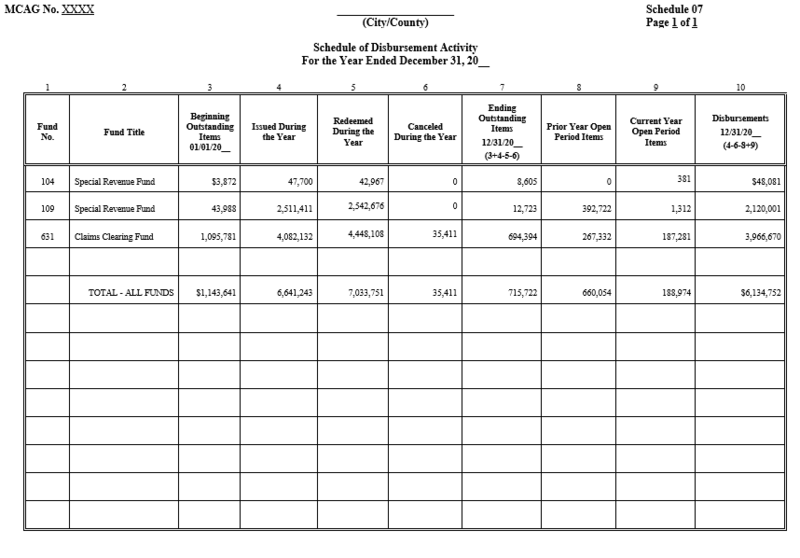 This includes the open period items from the prior reporting year and excludes the current year open period items. All redeemed warrants, checks and other disbursements from January 1 through December 31 of the reported year. For governments where warrants/checks are deducted from cash when redeemed, this column should tie to column 9 on the Schedule 11. Cancelled warrants, checks and other disbursements January 1 through December 31 of the reported year. Cancelled refers to instruments actually issued as reported in Column 4 but later either voided as invalid (accounted for as a reversal of the original expenditure) or identified as unclaimed property (accounted for as revenue). Ending outstanding items on December 31 of the reported year. For entities that act as their own treasurer, the total amount of ending outstanding items for all funds should be used as part of the year-end bank reconciliation. This column should equal column 3 plus column 4 less column 5 less column 6. Disbursement activities from January 1 through the end of the open period of the reported year for expenditures incurred and properly chargeable against the previous year’s budget appropriations. As described in Fund Types and Accounting Principles, the open period for cities is defined by RCW 35.33.151 or RCW 35A.33.150 as being January 1 through January 20. RCW 36.40.200 allows for an open period of up to January 30. Special purpose districts which use the county or a city as their treasurer may use the same open-period as their treasurer. If a district acts as its own treasurer, no open period is provided for by statute. Disbursement activities January 1 through the end of the open period of year following reported year for expenditures incurred and properly chargeable against the reported year’s budget appropriations. For districts that act as their own treasurer, the total amount of ending open period items for all funds should be used as part of the year-end bank reconciliation. Disbursements made during the fiscal period. This column should equal column 4 less column 6 less column 8 plus column 9. For governments where warrants/checks are deducted from cash when issued, this column should also tie to column 9 on the Schedule 11. 4.8.2.70 The template for Online Filing is available on the SAO’s website page at BARS Reporting Templates. The following is an example of the completed schedule.